The actor was born Marion Robert Morrison on 26 May 1907, in Winterset, Iowa, and moved as a child to Glendale, California. A football star at Glendale High School, he attended the University of Southern California on a scholarship but dropped out after two years. After finding work as a movie studio labourer, Wayne befriended director John Ford, then a rising talent. His first acting jobs were bit parts in which he was credited as Duke Morrison, a childhood nickname derived from the name of his beloved pet dog. Wayne’s first starring role came in 1930 with ‘The Big Trail’, a film directed by his college buddy Raoul Walsh. It was during this time that Marion Morrison became "John Wayne", when director Walsh didn’t think Marion was a good name for an actor playing a tough western hero. Despite the lead actor’s new name, however, the movie flopped. Throughout the 1930s, Wayne made dozens of mediocre westerns, sometimes churning out two movies a week. In them, he played various rough-and-tumble characters and occasionally appeared as "Singing Sandy", a musical cowpoke a la Roy Rogers. In 1939, Wayne finally had his breakthrough when his old friend John Ford cast him as Ringo Kid in the Oscar-winning ‘Stagecoach’. Wayne went on to play larger-than-life heroes in dozens of movies and came to symbolise the archetypal rugged, strong, straight-shooting American man. John Ford directed Wayne in some of his best-known films, including ‘Fort Apache’ (1948), ‘She Wore a Yellow Ribbon’ (1949), ‘Rio Grande’ (1950), ‘The Quiet Man’ (1952) and ‘The Man Who Shot Liberty Valance’ (1962). Off-screen, Wayne came to be known for his conservative political views. He produced, directed and starred in ‘The Alamo’ (1960) and ‘The Green Berets’ (1968), both of which reflected his patriotic, conservative leanings. In 1969, he won an Oscar for his role as a drunken, one-eyed federal marshal named Rooster Cogburn in ‘True Grit’. Wayne’s last film was ‘The Shootist’ (1976), in which he played a legendary gunslinger dying of cancer. The role had particular meaning, as the actor was fighting the disease in real life. In over four decades of acting, Wayne, with his trademark drawl and good looks, appeared in over 250 films. He was married three times and had seven children. 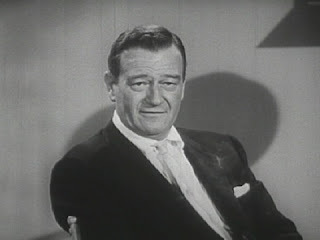 Marion Robert Morrison, de nombre artístico John Wayne (Winterset, Iowa, Estados Unidos, 26 de mayo de 1907 – Victoria de Durango, Durango, México, 11 de junio de 1979), conocido popularmente como The Duke (El Duque), fue un actor estadounidense que comenzó su carrera en el cine mudo en la década de 1920. Fue el símbolo de lo rudo y masculino, y fue un icono norteamericano durante muchos años. Es memorable el timbre distintivo de su voz, su forma de caminar y su presencia física. También fue célebre su postura política conservadora y su apoyo a las posturas políticas anticomunistas de la década de 1950. En 1999, el American Film Institute le otorgó el lugar número 13 en su lista de las 100 Estrellas Más Grandes de Todos los Tiempos. Una encuesta Harris publicada en 2007 le otorgó el tercer lugar entre las estrellas favoritas de los Estados Unidos, la única estrella ya fallecida de la encuesta y, a la vez, la única estrella que había estado apareciendo en ella todos los años. Su carrera fílmica comenzó en el cine mudo en la década de 1920, pero su éxito y fama se consolidaron entre las de 1940 y 1970. Su imagen ha quedado asociada, para muchos, con el género Western y con las películas de guerra, a pesar de que en realidad trabajó en muchos otros géneros (biografías, comedias románticas, dramas policíacos, etc.). Wayne ganó un Óscar al mejor actor por su papel en la película True Grit (1969). Muchos piensan que el premio fue otorgado en reconocimiento a sus 40 años de carrera, más que por su desempeño en este filme en particular, ya que tuvo mejores actuaciones en Red River (1948), She wore a yellow ribbon (1949 ) y The Searchers. Wayne también estuvo nominado para mejor actor en Sands of Iwo Jima, y la película El Álamo (1960) estuvo nominada para el Óscar a la mejor película, y fue Wayne productor de la misma. Él también dirigió el film The Green Berets (1968), la única película hecha durante la Guerra de Vietnam en mostrar soldados norteamericanos a favor del conflicto.